I am excited to announce that with the recent upgrade, Azure Site Recovery is generally available (GA) in the current Azure portal with a simplified experience and works with Azure Resource Manager (ARM). With this release, it is also available in the Cloud Solution Provider (CSP) program! 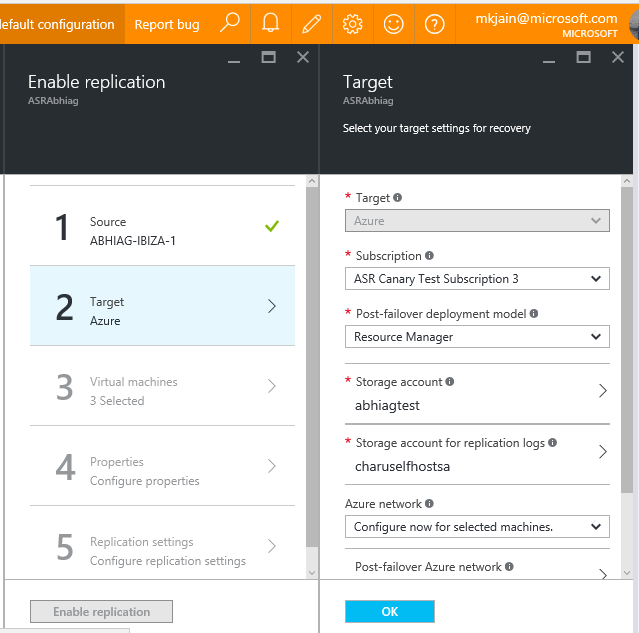 This step furthers Azure Site Recovery’s (ASR) mission of democratizing disaster recovery. Part of the Operations Management Suite (OMS), ASR is enabling many organizations to protect their businesses against disasters through its easy-to-use and cost-effective design. a) Heterogeneous environments – since a lot of customers have a mix of VMware, Hyper-V and physical, ASR supports protection of all these, either into Azure or to a secondary datacenter. Further, for Hyper-V, customers that have SC MM or manage the virtual machines outside SCVMM, can both protect via ASR. b) Complex application recovery – to support applications spanning multiple tiers, ASR provides recovery plans that automate recovery of applications. c) Lack of a secondary datacenter – with world-class datacenters in multiple regions, Azure is the ideal target for protecting these applications and ensures organizations do not have to invest capital expenditure. With this release, you get to use ASR in the improved portal – knowing where you are is simple, you can pin items of your interests, and additionally you can save your journeys in case you want to save your work and come back later to finish a task – all the goodness of the portal. This move is a big step forward towards the simple DR promise, which directly impacts the cost and raises the trustworthiness. You create Recovery Services vault from the Backup and Site Recovery (OMS) tile under the “Management” section. 1) Streamlined ‘Getting Started’ experience designed to ensure that our customers are setup for success. In DR, there are many moving parts and one step missed could lead to a failed protection or recovery. Historically, that has been the main reason why disaster recovery solutions are poorly deployed with many workloads going unprotected in an underserved market. Having a step-by-step guide that ensures you are setup for success is key, therefore, we have invested heavily in the Getting Started experience. The experience begins by asking you for your protection goals first and then prepares the rest of the experience tailored for that. Specifically, it prepares your source, ensures your target is ready – checking for Azure storage and network, associates the replication settings/policy with your server and prompts you to use the capacity planning tool. These steps have been stitched together based on sources like direct customer feedback, data from our service on usage/errors as well as the various forums – we want you to be set up for success and have designed the portal to make sure you don’t miss any steps to protect any data. 2) The next on the top list is the protection experience – this is a wizard to guide you through protection of your servers, built with smart defaults. This wizard gets information on your source, then performs the checks to ensure your target is ready. Post that, in the third blade, you select the servers you want to protect and provide information about them in the fourth step. Finally, you provide the replication settings – primarily policy you would like to use. ASR’s mission is to democratize disaster recovery and with all round investments in protecting any source to any target, performance, simplification, diagnostics, etc., we do expect our customers to leverage ASR to get more of your workloads into the protection fold – so when you protect the next set, the goal is that experience should be smarter. This wizard remembers your choices, making it a breeze when you want to protect more virtual machines. With this release, you can protect your virtual machines and physical machines into ARM storage accounts. At failover time, the servers will come up as RM Virtual Machines connected to ARM networks. The benefits of ARM are many as detailed in this overview– listing a couple here as it applies to ASR. a) Coexistence of virtual machines of any size or any network configuration inside a recovery plan – with classic, few sizes could not exist in the same cloud service, making application recovery hard or requiring compromise on the size. For example, if you had a SQL that required a DS-series and your front end was good with a standard A4, and you put them in a recovery plan – the failover could fail as these two size – DS and A4 – cannot coexist in the cloud service, which the recovery plan creates as part of it’s failover workflow. Similar challenges exist on the network configurations – based on the number of NICs. All these woes have been addressed in ARM architecture. b) Controlled access to resources – with role based access control available in ARM, you could achieve fine grained access to the ARM resources. You can create different resource groups with the access to the right folks and ensure that machines come up in the right resource groups. Usage of ARM resources is optional. Alternatively, if you have existing IaaS deployments and need your disaster recovery to co-exist with the same, then you can use the classic resources as well. These options of ARM and classic are available for all scenarios – VMware, Hyper-V for enterprises (SCVMM-based deployments), Hyper-V for branch offices, physical machines as well as AWS to Azure migrations. Moreover, within a single scenario, you could even use ARM for some Virtual Machines and use classic for the others. Backup and DR solutions are closely related in terms of the goal – they help organizations meet BCDR and compliance needs. A lot of our customers use both. In the classic portal, you would have created separate vaults – Site Recovery and Backup vaults – you would have had different experiences as well as managed more objects. With the goal of simplification, these experiences are now merged into the Recovery Services vault. Now you can protect servers for DR or backup from the same vault and experiences have similarity for both. CSP is an offer to enable partners resell solutions and business on Microsoft cloud technology. CSP enables the partners to be the first point of contact for their customers’ needs, and the center of the customer relationship. This enables them to build strong relationships with their customers by managing the end-to-end experience. DRaaS as a business is widely driven by partners, where they have been providing significant value add to the customers by offering a spectrum of services from DR consulting all the way up to fully managed DR services. Our partners have been waiting on the ASR to be supported in CSP with full experience support via the user interface (UI). Well, the wait is surely over, as our current update all ASR scenarios are fully available under CSP with full UI support. Often our customers ask these following questions ‘I have a large tempDB volume with my SQL – I don’t want to replicate this volume. Is that possible with ASR?’, ‘I have a page file with a lot of churn – can I exclude this when protecting to Azure?’ “I have bandwidth challenges but want to protect my servers. I want to save bandwidth by excluding temporary files which I can put into a separate disk – how can I achieve that?”. 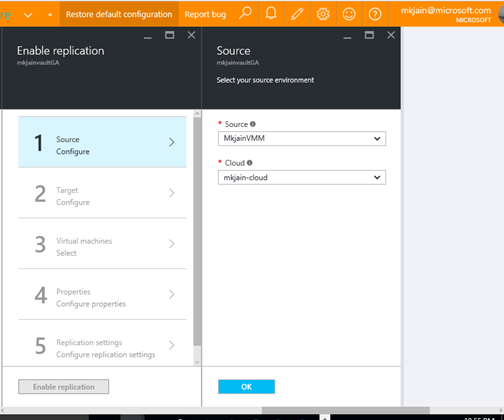 With this release, you can exclude volumes from replication while enabling replication. 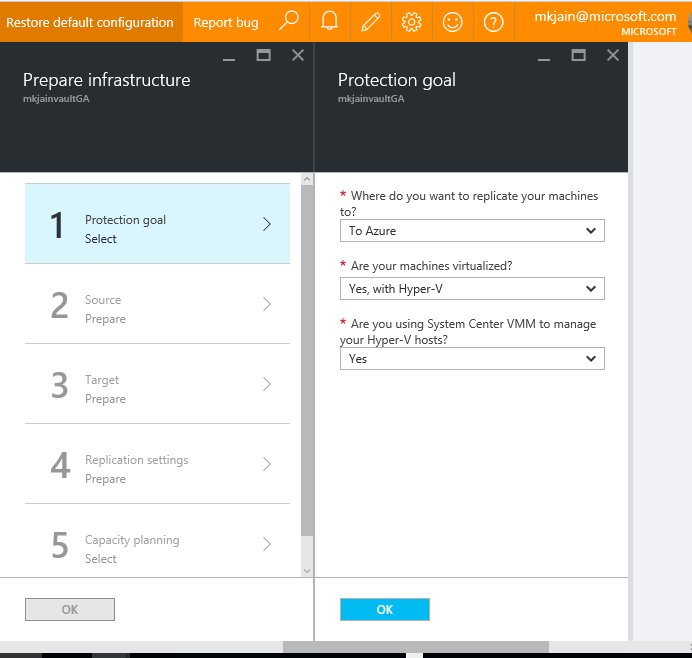 This capability has been enabled when protecting from VMware to Azure scenarios – in the near future, we will bring this capability to the Hyper-V scenarios as well. For leveraging this functionality, you need to ensure the mobility service is installed into the server – the mobility service gathers information about the volumes and sends it to the ASR service, which then displays the list of volumes, so you can exclude the volume containing any of those files - tempDB, the page file disk, temporary files, etc. Another scenario we often get feedback about is – “My workload needs high IOPs and that is offered on Azure only by premium storage accounts”. To enable you to protect your high-churn workloads, we are enabling you to protect servers into premium storage accounts. This capability has been enabled for VMware to Azure and we will bring this capability to the Hyper-V scenarios in the near future. For using this feature, you will need two storage accounts – the Premium Storage account which will be where your final servers will come up after failover and another one that receives the logs that are sent from the source. To understand the design considerations of this feature, watch out for a detailed blog from one of my colleagues which will show you what’s below the hood. We highly recommend Globally-redundant storage to ensure protection against outages within our datacenter. At the same time, we know customers want to extend protection their less critical applications, albeit at better economies. To meet that need, we enable support for LRS with this release – this is supported for all the scenarios. To summarize, the general availability of ASR in the improved experience enables our customers and partners to use the ARM resources as well as CSP subscriptions, with new functionality around saving bandwidth by excluding volumes or using new types of storage to meet the economics or workload characteristics. A short FAQ is provided below. Q – Can I use this new experience with ARM resources only? You can use this experience for ARM as well as classic/ASM resources, in case of coexistence with existing deployments. Also this is available for all the supported scenarios – VMware/VMM/Hyper-V to Azure as well as VMM to VMM. Q – I am a customer using the classic experience, how do I move to the new Azure Experience? Q- Is there any price changes in relation to this new release? This release does not impact the pricing. With the streamlined experience and improved diagnosability, the overall costs of deploying a disaster recovery solution will come down.